He’s known to be the hardest working man in Hollywood. And it seems Ryan Seacrest extends that ethos to his physical appearance, as he made clear on Monday when he revealed he’s about to embark on a week-long juice cleanse. 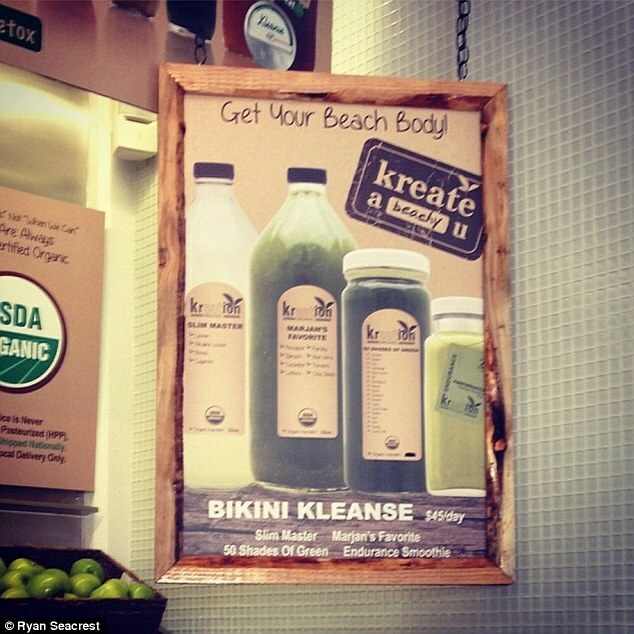 While we probably won’t be seeing Ryan don a bikini anytime soon, he’s clearly keen to try the juicing trend so beloved by Hollywood’s slimmest starlets. By starting the regime, which costs $45 a day, the American Idol host seems to be gearing up to hit the beach this summer. The programme, created by Kreation Juice, includes four green concoctions with names such as Slim Master, 50 Shades Of Green and Endurance Smoothie. The liquids claim to be be ‘mood enhancing,’ ‘metabolism boosting’ and ‘fat fighting,’ although Ryan hardly seems in need of a slim down. The radio personality and producer showed off his toned physique on holiday with ex-girlfriend Julianne Hough in May last year. Since then, he’s been linked to Dominique Piek, a Sports Illustrated model from South Africa who used to date Star Trek star Chris Pine. Last month, it was revealed that Ryan will be returning to host the next season of American Idol, along with judges Jennifer Lopez, Keith Urban and Harry Connick Jr.